I finished hand-stitching the binding on the Hemingway Quilt this morning. This is another top that was machine quilted over the Thanksgiving weekend. 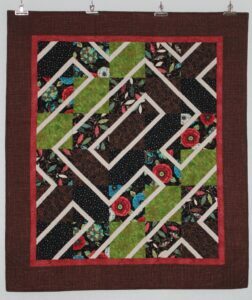 It is quilted with monofilament thread and a meander motif in the center. In the border I used one of Angela Walter’s curvy designs. Hemingway is the 21st finish for the year – only 4 more to go to make my 2017 goal. Guess I had better get working on the next one.